A liquid or sauce made with ingredients, such as fruits or vegetables, that have typically been puréed and strained to create a thick sauce-like consistency. The sauce may be thick, but is still easily poured. 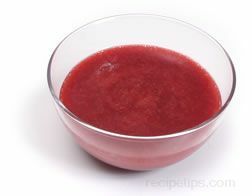 When making a coulis, it is important to not over or undercook the ingredients, so the texture and flavor are not diluted if overcooked or too stiff and thick if undercooked. Tomatoes are often used to make a tomato coulis, serving as a base for tomato soups and sauces, or passattas, fish sautês, grilled fish, and fresh pasta dishes. Similarly, other fruits such as raspberries, blueberies and strawberries are made into a coulis to be served over foods such as cheesecake, ice cream, tortes, soufflés, crêpes, waffles, pancakes, and French toast. Coulis may also be used to refer to as a pureéd shellfish soup that has a thick consistency.